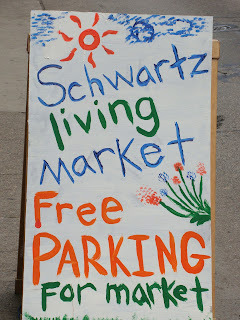 Schwartz Living Market now open Saturdays 11:00 AM to 3:00 PM! We anticipate opening four days a week with a night market after Labor Day, and six days a week by the end of this calendar year!! We're open for business, and we are so excited! Please join us with a friend or two or three to see what's new each Saturday. This coming Saturday, June 29, 2013, in addition to the amazing Foods and Arts and Healthful Living vendors, Yes Brain Dance Theatre will perform from 11:30 to 12:30, and Community Capoeira Angola Pittsburgh will perform from 1:00 to 3:00 PM. Vendors on Saturday, June 29, 2013 from 11:00 AM to 3:00 PM include: Jonathan's Foods; OmNom Bakers; Green Mango Thai Cafe; Third Day Organics; Thrice Great Apparel; RosaFlora Botanicals; Yellow Corn Native American Recovery; Native American Fine Artist Harry Nez; Central Native American Arts, Miguel Sague; Richard Snyder Photography; Laura Beck Photography; Building New Hope Coffee; Vision Gym with Elisa Beck, Developmental Optometrist; Tamar George; Hoola Hooping; Sprouts Demonstration including Wheatgrass, Sunflower shoots and pea shoots and more! Thanks so much to the PA Resources Council and their Zero Waste Program for the composting, recycling and trash containers. Thanks to Conservation Consultants for their display. Vendors vary slightly weekly! Join us and bring a friend or two and your family. This is a grass roots, transitional, transformational process! Google Transition Town and Rob Hopkins and read Rob's blog to know where we are coming from. Check out the Transition Town movement here in the 'Burgh. How do we re-invent ourselves as a culture...how is it that we will transform ourselves from peak oil to resilience in the words of the Transition Town movement and be inspired by the Natural Step? Come on in and find out!! Learn about how you, too, can create a Living Building Challenge project and have lots of fun with it! SAVE THE DATE and join us for a special healthful living Mini- Market on Wednesday evening, July 3, 2013, from 5:00 to 9:00 PM, with Brian Clement, Ph.D., of the Hippocrates Health Institute in West Palm Beach, Florida. Join us for Dr. Clement's talk A Celebration of Health, Happiness, and Freedom at 7:00 PM followed by Q&A and book signing! Direct inquires to Elisa Beck at 412-491-0303. 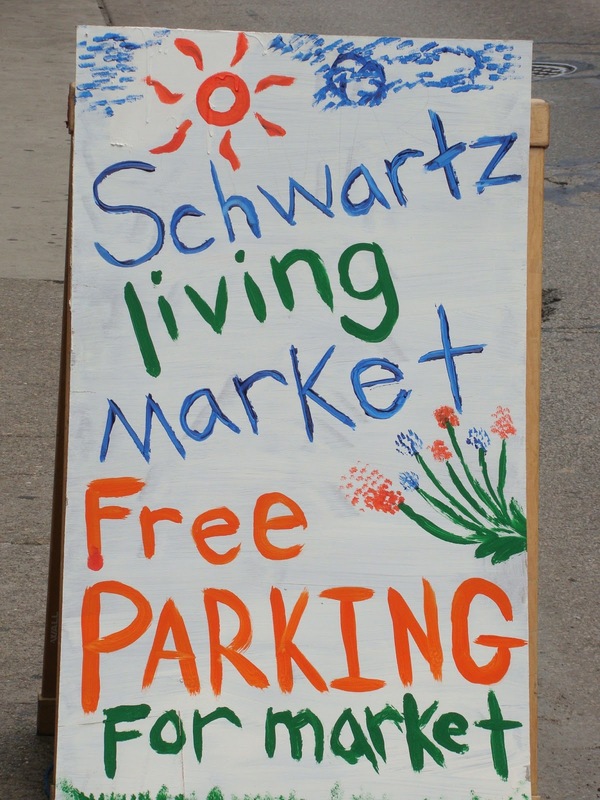 Schwartz Living Market on Grand Opening Weekend, June 21,22 and 23, 2013! Grand Opening Festivities at Schwartz Living Market! We're into the Grand Opening weekend at Schwartz Living Market and loving it! We are so thrilled to see so many amazing folks each day come out and play and eat and watch movies and talk and network! Healcrest Tea Pops Pop Up! Tribune Review photographer doing some eye tracking in the Vision Gym! 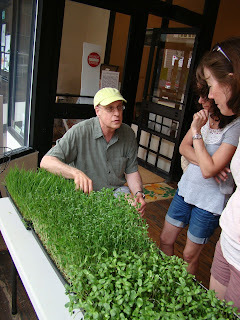 Stan Beck talking with Becky and Libby about indoor sprout farming! David Smith of Non-Profit Yellow Corn Native American Recovery; Kate O'Brien, visionary; and Harry Nez, amazing Native American Artist with his hand drawn treasures. Grand Opening Festivities on June 21, 22 and 23, 2013 at Schwartz Living Market: An Urban Oasis for Healthful Living! Join us on June 21, 22, and 23, 2013 from 11:00 AM to 3:00 PM each day for our Grand Opening! Breaking News: At 2:00 PM on Friday, June 21, 2013, at 1317 East Carson Street you are invited to join us for the Ribbon Cutting for Schwartz Living Market! Bruce Kraus, Councilman for the South Side will be there with us along with many other amazing folks to cut the ribbon!! Schwartz Living Market: A Project of 1317 East Carson Street has hired a market manager! Paul Krawczykiewicz, our new market manager, managed Today's Market in Oakmont, Pennsylvania for 17 years and is an amazing individual. We are so excited to welcome Paul to our team! Please direct inquiries for vendor space for our opening weekend and beyond to schwartzlivingmarket@gmail.com or call 724-787-5788. Application forms for vendors and lease forms are available for those interested in three month leases. following the Grand Opening on June 21,22 and 23, 2013, we will be open on Saturdays from 11:00 AM to 3:00 PM and plan top expand hours to four days a week, Thursday, Friday, Saturday and Sunday after Labor Day, 2013. Stay tuned! Thanks so much to all of the amazing individuals and group that have made this continuing process and project possible. We are full of gratitude! Enjoy the experience of vendors with real food and amazing juices including wheat grass juice and much, much, more! See demonstrations of, and learn how to juice. See how to sprout mung beans, chick peas and aduki beans. Learn how to soak seeds and nuts. Learn how to grow your own sprout farm at home with Stan Beck. Taste sprouted foods. Learn how to dehydrate food in creative ways! Enjoy amazing tea pops from Healcrest Farms. Hear Phil Osophical and his amazing Flowetry! Check out so many amazing non profits including PA Resources Council, Conservation Consultants, Green Building Alliance, Zero Waste Pittsburgh and more. On Saturday, June 22, learn about GMO-Free PA. Experience Vibroacoustic Harp Therapy from Stephanie Miller, Vibroacoustic Harp Therapist: $45.00/half hour. Learn about optometric vision therapy and somatic movement education with Dr. Elisa Beck, Developmental Optometrist and Somatic Movement Educator trained in Body Mind Centering and Body Mind Movement with both Bonnie Bainbridge Cohen and Mark Taylor. Learn about Permaculture from author, Permaculturist, and owner of Three Sisters Farm, Darrell Frey. Talk with Dennis Maloskey about Sustainable Living. Learn from Christina Newman of Apoidia Apiary. As a pioneer in the field of spirituality and ecology, Thomas Berry created a quiet revolution. He was a monk, a cultural historian, an author, a teacher and a mystic. At the heart of this film is Berry's experience of the universe as a cosmic liturgy. He reminds us that "we are not a collection of objects but a communion of subjects." His values are rooted in this sacred cosmology which includes the entire natural world. The mountains, rivers, birds, fish--all living organisms--are not here for our use, but exist in dynamic relationship: a relationship that allows us to become who we are. As Berry says, "I am not myself without everything else." This video will be followed by a discussion led by Karen Bernard. Karen is one of the founders of Dream of the Earth, a local nonprofit that has taken on Berry's vision of "the great work," the work of reinventing ourselves as humans through the telling of a comprehensive story that we can all live by. Many people now believe that this new story, based on solid empirical science, has the power to usher in a new "ecozoic" era, a time when human beings live in mutually enhancing relationship with the rest of creation. Suggested Donation for movie viewing is $3.00/person. Proceeds split between the designated non-profit and Schwartz Living Market for its continued Permaculture/Transition Town Demonstration Project Development. Yes, this is slow development, and mindful development and happens in an unexpected way! Hey, bring some money to spend and bring lots and lots of friends and neighbors. At 3:00 PM each day, Elisa Beck will give a tour of the building. Charge $5.00/person or $15.00/family. Is this a Grand Opening, a grand re-opening, or simply a reinvention of all that already was and will continue to be? It's really the evolution of Schwartz Market which began as Schwartz Sanitary Super market in the early part of the century with Helen and Morris Schwartz and so much more family. This is the story of evolution and revolution at this point. We are re-opening the space as a Living Market. Use your imagination and you too can be part of the action, not just the reaction! Have you heard of a boilermaker? Well what do you call a shot of wheatgrass juice in 8 ounces of green juice? 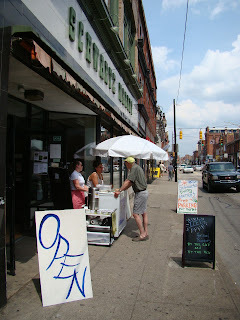 Cast your vote on opening weekend at Schwartz Living Market: An Urban Oasis for Healthful Living ! The new Marmoleum kitchen floor is fully installed! Thanks so much to these incredible, mindful installers from Riverview Carpet, and thanks so much to Forbo for supplying this amazing product! Vendors over the course of the weekend will include: Jonathan's Food, Gryphon's Tea, OmNom Bakers, Jenn's Jems, Global Lovin', Third Day Organics, Paititi, Healcrest Farms, Thrice Great Apparel, Apoidia Apiary, Enchanted Garden, Rosa Flora Botanicals, Central Native American Arts and Crafts, Native American Arts and Crafts, Richard Snyder photography, Building New Hope, JWest Design, S'Eclairer, Riverview Carpet, Forbo Marmoleum, Artemis Environmental and more! Dennis Maloskey will be there demonstrating a hand powered generator, Willi Williams will demonstrate how to apply earth plaster on stilts, and Elisa Haransky-Beck, developmental optometrist and somatic movement educator will be happy to talk to you with tips for natural vision improvement. Jump on the mini trampoline and learn about improving your peripheral vision by experiencing it! Dr. Safdar Chaudary will be there representing S'Eclairer and Janet McKee will be teaching us about healthy food choices! This opening weekend and Schwartz Living Market is family and kid friendly. Tell everyone you know to join in on the fun! Join Schwartz Living Market on Facebook. See you soon! Pulling weeds from the fields by hand: Tara Frey, Paul Krawczykiewicz, Richard Pearson, Kate O'Brien, Darrell Frey, Pam Barroso and Elisa Beck. Well, Elisa is waving to the camera, not weeding!